One of the most exciting finds on an archaeological site are the remains of a building or structure—evidence of people modifying their natural world to create a controlled space. Whether it is a dwelling, store, barn, or other building, the activity of using tools to create construction materials and combining these fragments to craft shelter is one of the hallmarks of humanity. During the Riverfront Park data recovery in Fredericksburg, Virginia, Dovetail Cultural Resource Group found not one but five foundations, each a unique symbol of the city’s evolution (Photo 1). The archaeological work was done at the request of the City of Fredericksburg prior to park development. This blog is the first of several that will focus on the results of our January/February 2019 data recovery at the Riverfront Park. We thought we would set the scene for upcoming installments by discussing the buildings that once dotted the landscape. Future blogs will take the next step and describe the thousands of artifacts once used by area inhabitants and recovered during this incredible dig. Photo 1: Adriana Moss Excavates a Brick Foundation at the Riverfront Park. The first European settlement on the Fredericksburg riverfront occurred early in the community’s history. Even before the town had a formal street system, dwellings were being erected along the riverbanks. One of the earliest was a home that we now call the Rowe-Goolrick House, located at the southern end of the proposed park. Built in the mid-eighteenth century, this two-story, three-bay home did not face today’s street grid but rather the original town ferry lane, which ceased use shortly after the home was constructed. The foundation of the house was fashioned of local Aquia sandstone, forming a basement and support system for the frame structure above. The home was demolished in 1973 to make way for a parking lot. During the Riverfront data recovery, Dovetail uncovered the northeast corner of the foundation, still in pristine condition (Photo 2). Possible original support posts were even found in place in the basement fill. Dendrochronology (tree ring dating) is being done on these supports to date these incredible building fragments. Photo 2: The Rowe-Goolrick House in 1933 (left) (Library of Congress 1933) and the Home’s Stone Foundation (right), Found under a Parking Lot. On the opposite side of the park, in the northern segment near Hanover Street, the team uncovered not one but two incredible foundations. Each featured handmade brick with sand temper made in wooden molds; the foundations were fastened with mud mortar. In the northwest corner was the foundation of a one-story, four-bay brick duplex at 717–719 Sophia Street built around 1780. Interestingly, this home had a central chimney that serviced both sides of the double dwelling—a feature usually seen in New England (Photo 3). In the northeast corner was the brick foundation of the circa 1832 Ferneyhough ice house, a public ice facility. This feature measured over 30 feet in length, dug into a subsoil of very dense clay (so dense that the backhoe could not penetrate the soils) (Photo 4). Excavation of this clay with hand tools to adequately lay the deep foundation would have been incredibly challenging! Photo 3: Brick Duplex at 717–719 Sophia Street in 1927 (left) (Library of Congress 1927) and the Building’s Foundation and Central Chimney Base Uncovered During the Dig (right). Photo 4: The West Wall of the Ferneyhough Ice House Discovered 4 Feet Below Ground. In the middle of the park, archaeologists found the brick foundation of a postbellum home once located at 713 Sophia Street and an antebellum duplex that once stood at 701–703 Sophia Street (Photo 5). Both of these buildings had a timber-frame structural system sitting on brick, stone, and wooden pier foundations. Each was in use for only 50 to 75 years before they were demolished, reflecting the transitory nature of life along the river where repeated flooding and changing transportation needs rendered an ever-changing landscape. All of the buildings found in the park area were someone’s home, someone’s work, someone’s life. When joined, these fragments come together to tell the story of so many who once walked in our footsteps and dwelled at our doors. Photo 5: The Fredericksburg Riverfront Park Around 1920. From left to right: brick duplex at 717–719 Sophia Street; home at 713 Sophia Street; Home at 705 Sophia Street (not excavated during current fieldwork); and wood duplex at 701–703 Sophia Street (Shibley 1976:137). 1927 Cabin, Water Street, Fredericksburg, Virginia. Frances Benjamin Johnson Collection. Library of Congress Prints and Photographs Division, http://www.loc.gov/pictures/item/2008675923/, accessed July 2013. 1933 House, 607 Sophia Street, Fredericksburg, Fredericksburg, Virginia. Historic American Building Survey. Library of Congress Prints and Photographs Division, http://www.loc.gov/pictures/item/va0925.photos.165656p/, accessed July 2013. 1976 Historic Fredericksburg: A Pictorial History. The Donning Company/Publishers, Inc., Norfolk, Virginia. In this month’s blog, we are highlighting a whiteware basin with a flow blue Scinde pattern from the mid-nineteenth century. The object was brought to the Dovetail lab by a curious owner from Stafford County. The vessel had once been broken into several large pieces that someone had attempted to glue back together (Photo 1). With permission from the owner, the archaeology lab at Dovetail conserved the bowl in a more appropriate and safe manner. Through a step-by-step analysis, this blog will discuss the conservation methods utilized to preserve the bowl’s integrity. Photo 1: The Basin Before Conservation Efforts Began. Notice the giant glob of glue put in place of a missing sherd! The first step was to remove the adhesive that had been used to refit the bowl when it originally broke. In order to do this, we had to first determine what type of glue was used and how, or if, it could be removed. With its black color, we believed the adhesive to be JB Weld—a high-temperature epoxy adhesive that is not removable. In order to get a clearer answer, we took the bowl to the Virginia Department of Historic Resources (DHR) in Richmond and with the help of Katherine Ridgway, a conservator at DHR, we received great news. It was not JB Weld, but just a normal, removable, adhesive that had been painted over with either black paint or sharpie in an attempt to blend in with the dark blue pattern. We quickly got to work removing the black paint and as much of the glue as possible with just cotton balls and acetone. However, the adhesive was not budging. The next step was to put the bowl into an acetone chamber, where the bowl is placed in a bag or container along with acetone-filled jars so that the acetone vapors can break down the adhesive and allow for separation (Photo 2). After a few weeks of being in the acetone chamber, the pieces had finally fallen apart and it was time to start removing the leftover residue and begin re-mending. In order to remove the excess residue we soaked the sherds in acetone and then used scalpels to peel the adhesive off of the fragments. Photo 2: The Basin After Removal of Adhesive, But Before Acetone Chamber. To re-mend the basin, we used Paraloid B-72: a clear, thermoplastic resin that is commonly used in conservation and restoration. It is more flexible than most other adhesives and, most importantly, it is dissolvable in acetone! It is highly important that whatever was done to the basin must be reversible; this is true with all conservation and restoration work. In the lab at Dovetail, we regularly use B-72 for labeling artifacts and mending ceramics or glass. After several months of work, the bowl was finally finished (Photo 3). We hope to continue restoration by filling in the damaged, colorless areas with compatible paint colors. So, next time you break your grandmother’s favorite dinner plate, ask an archaeologist to repair it for you! Photo 3: The Finished Basin. July continues our series of posts highlighting the artifacts recovered from the Trogdon-Squirrel Creek site (31Rd1426/1426**) in Randolph County, North Carolina. Dovetail Cultural Resource Group conducted data recovery excavations at this site on behalf of the North Carolina Department of Transportation (NCDOT), guided by the data recovery plan authored by NCDOT (Overton 2014). Of the over 8,000 ceramic sherds recovered from the Trogdon-Squirrel Creek site, nearly half (3,826) were made in North Carolina. These locally produced wares underscore the importance of the ceramic industry to the economy of piedmont North Carolina and the reliance of residents on locally manufactured goods. This blog post focuses on some of the wares whose makers can be identified in order to illustrate the number of potters in the region and how far people would go to buy their goods. For a more detailed treatment of these ceramics click here. Marked, or otherwise identifiable, wares from at least six different potters were identified in the collection gathered from the site (Table; Photos 1–7). Dates of production for these potters, when they were not known from historical references, were estimated by adding 20 years to their birth date and extending the span to the date of their death. While the production span for some of these wares may be slightly shorter or longer, they are probably not exceedingly different. The majority of these potters began production prior to 1850. However, most had a production range that extended through the latter half of the nineteenth century. Notably, all of these potters had kilns in Randolph County during at least some portion of their career. Jacob Craven had at least three kilns during his lifetime, one of which was in Randolph County, while the remaining two were located just south of the county line in Moore County. All of the kilns used by these potters during their periods of production were located within 14 miles (22.5 km) of the Trogdon-Squirrel Creek site and half were within 10 miles (16.1 km) (Figure). Table: Identified Potters Represented in the Trogdon-Squirrel Creek Assemblage. 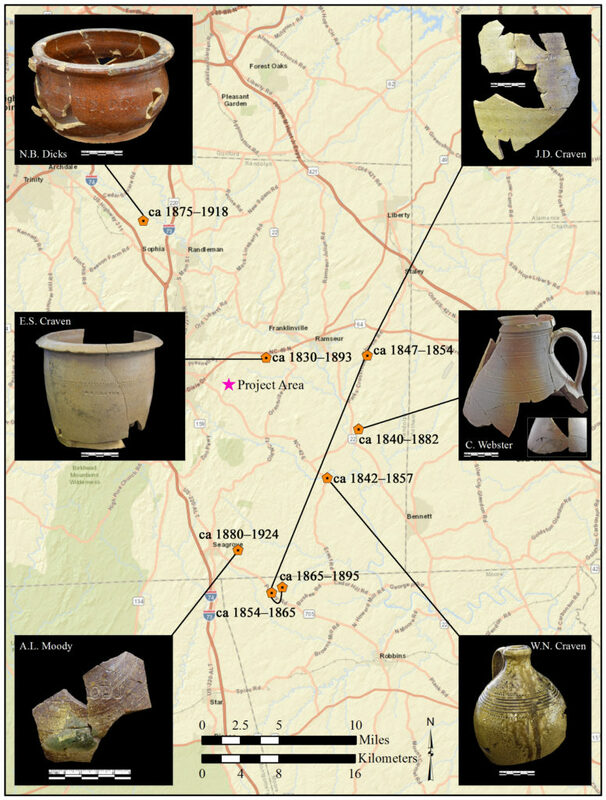 A brief glimpse of this extraordinary grouping of locally made ceramics from the Trogdon-Squirrel Creek site provides important insight into the development of the ceramic industry in Randolph County from approximately 1840 to the early-twentieth century, a period when the potting tradition in this region was flourishing. It also suggests that local residents were paramount in supporting these artisans throughout history, allowing potters and their families to put down roots and prosper in the region. As a result, many of the descendants of the potters identified in this assemblage still produce ceramic wares in the area and pottery production remains an important aspect of the economy in the North Carolina piedmont. Photo 1: Locally Made Coarse Earthenware Jar Fragment with Sine Wave Decoration, Attributed to Nathan Dicks. Photo 2: Locally Made Earthenware Chamber Pot with N.B. Dicks Mark. Photo 3: Locally Made Stoneware Jug with W.N. Craven Mark. Photo 4: Locally Made Stoneware Pot with E.S. Craven Mark. Photo 5: Locally Made Stoneware Jug or Pitcher with J.D. Craven and Capacity Mark. Photo 6: Locally Made Stoneware Vessel with A.L. Moody Mark. Photo 7: Locally Made Stoneware Jug with Bird Decoration Attributed to Chester Webster. Figure: Map Showing Location of Kilns for Identified Potters in Relation to the Trogdon-Squirrel Creek Site. Check out Jefferson Patterson Park’s Diagnostic Artifacts webpage for more images of stonewares recovered from the Trogdon-Squirrel Creek Site. Discussions with local North Carolina potters, scholars, and collectors of North Carolina pottery were instrumental in the identification of the locally produced wares from the Trogdon-Squirrel Creek site. Specifically, I would like to express my gratitude to Hal Pugh and Eleanor Minnock-Pugh of New Salem Pottery, Mary Farrell of Westmoore Pottery, and Tommy Cranford.